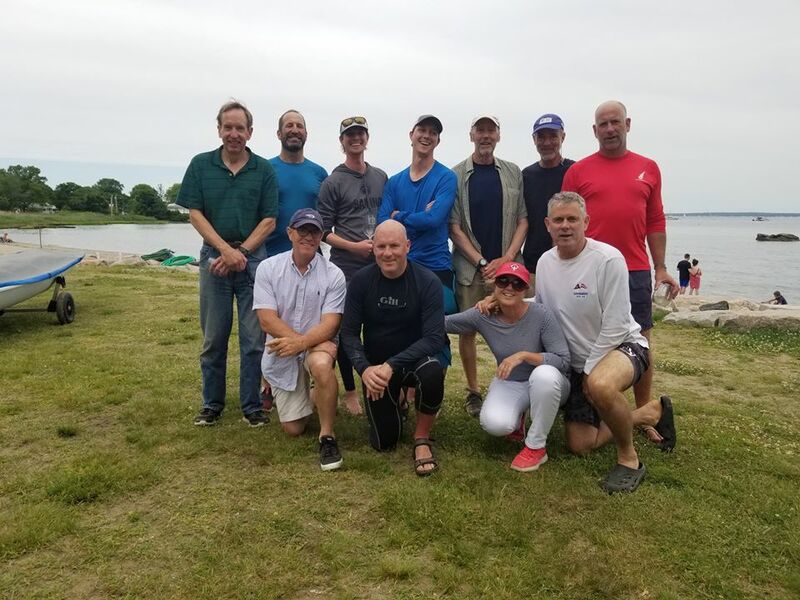 I think people are still a bit traumatized by the 25-30+ knot breezes experienced in 2016, but this year's Wickford Regatta was quite light; we might have seen 8-10 knots at times on Saturday. 5 races were sailed in all: 4 Saturday (followed by an *amazing* apres-sailing dinner, including DIY ice cream sundaes - your scribe went back for seconds), then one very light air race on Sunday before the Northerly completely died. 15 RS Aeros contested this year's event. The size and quality of the fleet was definitely noticed! What was especially neat is that 11 owners were registered, indicating the building take rate of boats in the New England area. The charterers made their presences felt. Quentin Chafee, sailing an RS Aero for the first time, was impressively quick, and with great starts was often in the top 2 or 3 at the first weather marks; he ended up top RS Aero 7 rig and 8th overall. Phil Myerson sailed an RS Aero 9 for the first time and quickly figured it out, walking away from the fleet early in Race 5 (and ending up 5th overall). Ben Chafee and Alan Harris, both Zim Sailing employees, rounded out the charterers, getting first-hand experience sailing boats they love to move around their shop and deliver - due to the RS Aero's 66 lb, (30kg) hull weight, no doubt. The fleet is getting faster and faster upwind, as evinced by Timothy Desmond (2nd Overall), Eric Aker (3rd) and Jim Myers (4th). These three were seen duking it out at the front of the fleet on the beats, often pointing higher than me while maintaining pace. I mostly made moves downwind, working little breeze variations and waves that little bit extra to eek out the boat lengths. At the clinic before the Newport Regatta (July 6, then racing on 7-8) we can focus on reaching and running set-up and technique. See you there!